Ashton & Lea Golf Club provides a warm welcome to all golf societies, the course provides an attractive challenge to golfers of all abilities. Many societies, including some from as far away as the south west coast & scotland return year after year to enjoy the course and hospitality. We make it our mission to ensure that your society day runs smoothly from start to finish, whether thats the organisation of prizes, longest drive/ nearest to the pins or even handing out scorecards we will be on hand to help every step of the way. 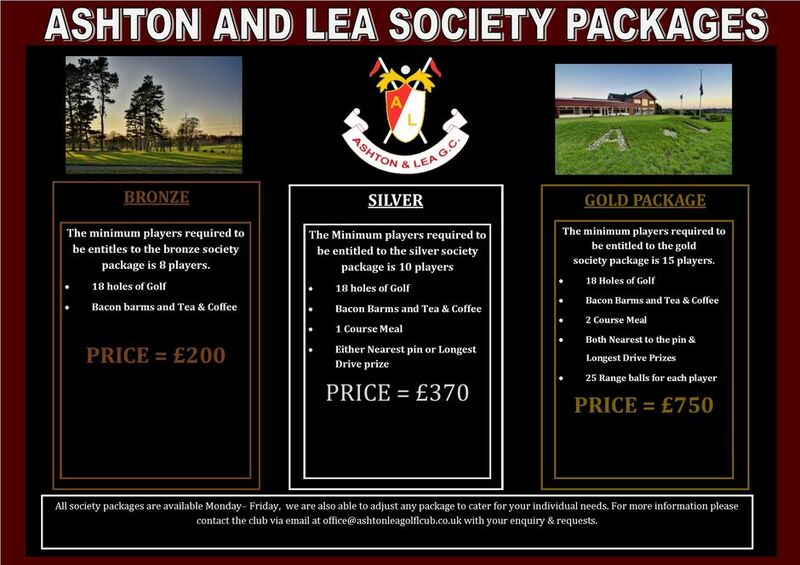 Ashton & Lea take pride in being able to provide a golf club that can cater for a wide range of societies from small society groups of 8 to large corporate & charity golf days. Packages can be built to suit your every need, so you wish to book, please contact the office on 01772 735282 (option1) or fill in the form below.